This article discusses some research carried out during the summer of 2001–02 at NSW Agriculture’s Wollongbar Agricultural Institute in northern New South Wales. The research examined the effect on milk production of grazing dairy cows if heat stress is reduced. There was a clear pattern of lower milk production when cows calved during hotter months. Milk fat and milk protein content both declined as the temperature–humidity index (THI) increased above 78 (see Figure 1). Reproductive performance declined as THI increased above 72. Altering the microclimate of cows that were being supplemented with high levels of total mixed rations during high THI conditions was shown to be economically viable, and the use of shaded feedpads fitted with sprinklers was the most profitable approach tested. cooling strategies were implemented only under potential heat-stress conditions. The typical summer grazing system at Wollongbar is for cows to graze kikuyu pastures which contain either shade trees or shade shelters. Cows are usually fed a grain-based concentrate at the rate of 7 kg/day, in the dairy. 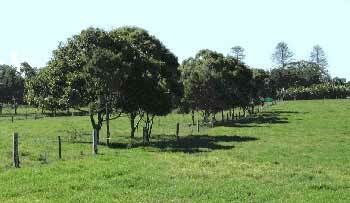 Cows were left in paddocks of kikuyu pasture and shade trees, similar to those shown in Figure 2. 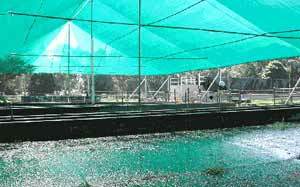 Cows were removed from paddocks and housed on a feedpad covered in polypropylene shadecloth graded '80% shade'. The feedpad was fitted with sprinklers located 3 m above the feedpad floor (see Figure 3). These sprinklers ran continuously while cows were housed on the feedpad. Once cows were moved to the feedpad from pasture, they remained there until the ‘pm milking’. Feed supplements were not available. Cows were treated as in treatment 2, but were given 3.5 kg lucerne hay per cow while housed on the feedpad. There were 15 early lactation cows in each group. The average shade provided by the paddock shelters and shade trees (80% of incoming light) was similar to that provided by the shadecloth covering the feedpad. The experiment lasted for 107 days. Of the 107 days of the experiment, there were 55 days when cows in treatments 2 and 3 were brought onto the feedpad. Heat conditions were severe on 11 days, with maximum daily air temperature greater than 35°C. On the days when cows were brought onto the feedpad, they were there for an average of almost 6 hours, with entry times to the feedpad ranging from 9 am to 2 pm. The THI averaged 78 in the paddock while cows were housed on the feedpad. Although a THI of 72 was the indicator of when to bring cows onto the feedpad, there were days during the experiment when the average paddock THI averaged less than 72 while cows were housed on the feedpad. This is because it became cooler or less humid on these days after the cows were moved to the feedpad. On average, cows left in the paddocks (treatment 1) produced 20–22 L milk/day. Figure 4 shows the differences in milk yield between cows left in paddocks and cows brought onto a shaded feedpad fitted with sprinklers (treatment 2). The effect of feeding hay to cows while housed on the feedpad (treatment 3) compared with those left in the paddock is also shown. Until the THI reached quite severe conditions (i.e. THI greater than 82), there was little advantage in moving cows from shaded paddocks to the feedpad. When average paddock THI was less than 72, bringing cows to the feedpad actually reduced milk production, probably due to less time being available for grazing. Feeding a hay supplement provided a daily increased milk production of 1.5–2.0 L milk/cow (i.e. about 0.4–0.6 litres milk per kilogram hay fed). Greater milk production responses to feeding hay were noted under severe heat-stress conditions (approximately 1 litre increase in milk production per kilogram hay fed). Milk composition was unaffected by the treatments. Another important result (not shown in Figure 4) was that cows supplemented with hay on heat-stress days also produced more milk on days when there was no intervention. This indicates that the higher plane of nutrition of cows fed a hay supplement may have had a residual nutritional benefit on cow metabolism on non-heat-stress days. Rectal temperature is a good indicator of heat stress in dairy cows. The upper limit of normal rectal temperature is 38.6°C. Rectal temperatures at 3 pm of cows kept in the paddock (treatment 1) were elevated on days when the THI reached 72. Up to a THI of 82, rectal temperatures of cows housed on the feedpad on heat-stress days remained normal. Rectal temperatures of ‘feedpad + hay’ cows were slightly elevated (0.2°C) when the THI was greater than 82 (see Figure 5). The degree of skin wetting caused by the sprinklers is an important factor in this process. Using fine sprinklers that produce a small droplet size can exacerbate heat stress by not achieving sufficient skin wetting. Cows in this experiment were saturated to the bottom of their flanks. This degree of wetting seemed ideal as it avoided wetting the udder and consequently increasing the risk of mastitis. The lower rectal temperatures of cows housed on the feedpad during this experiment show a physiological benefit of using sprinklers plus shade as opposed to providing paddock shade alone, provided by either trees or shadecloth shelters. The results indicate that as long as cows have access to good paddock shade, there is no advantage in terms of milk production to providing extra cooling with sprinklers unless conditions become severe, that is, when the THI is greater than 82. This would indicate that cows were able to compensate for decreased day-grazing bouts by increasing night-grazing bouts. Note that the reproductive benefits of cooling heat-stressed cows were not examined in this experiment. Providing lucerne hay while cows were housed on a 'shade + sprinkler' feedpad resulted in increased milk production. The highest response was recorded when the THI was greater than 82. The economic benefits of this response will depend on the price of milk at the time. Based on the results of this experiment (over 107 days with cows in early lactation) and a milk price of 30c/L, it would probably not be economical to feed lucerne hay once the price of that hay exceeded approximately $230 per tonne. Small portable temperature and relative humidity meters are available from electronics stores. The financial support of the Subtropical Dairy Program and the Dairy Research Development Corporation is acknowledged.